Many of our products are available with free shipping. Free shipping will be noted on the individual product page. All orders (except tile and tile kit orders) totaling $299 and over receive FREE SHIPPING. All orders (except tile and tile kit orders) under $299 will incur a small flat rate per item to cover the ever-rising cost of shipping and packaging materials. Flat rate and free shipping discounts only apply to orders shipping to the continental 48 US states. Tiles and Tile Kits do incur shipping fees (please contact us for a quote). 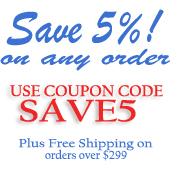 Flat rate shipping and free shipping are ONLY valid on orders shipping within the continental US states. We are currently only shipping to locations within the continental 48 US States. Certain products can be shipped to Canada, so please send an e-mail to info@poolandmarinepaint.com if you would like a quote or to find out if we can ship to you. Thank you. Orders typically take 1-3 business days to ship out of the warehouse. We make every effort to get orders out as soon as possible, but please be aware of the shipping times if you are trying to schedule a project. In times of high volume (spring/summer), orders may take a bit longer to ship out, but we try our best to get everything out as soon as possible. We recommend ordering your project materials way in advance of your project start time. We also recommend ordering and receiving your merchandise before scheduling or starting any project. Please contact us if you would like more information on shipping times. Custom tint colors can take longer to ship than stock color items. Orders get shipped from the warehouses via UPS Ground, FedEx Ground or freight carrier, depending on the size of the order. WE DO NOT OFFER EXPEDITED SHIPPING, EXCEPT FOR TILES/TILE MATERIALS. Orders are shipped from New Jersey or Florida depeding on the products ordered. Ground shipping takes 1-5 business days FROM TIME OF SHIPMENT to arrive at the destination. If you would like expected delivery times for your order, please contact us. We CANNOT guarantee shipping times or arrival dates. We try to get all orders out as fast as possible, but unfortunately, we cannot guarantee when your order will ship from the warehouse or when it will arrive to your location. We recommend ordering your materials far in advance of your project start date to ensure that your materials arrive in time. Problems can occur with shipping, such as back ordered items, items being lost by FedEx, wrong item arriving to you, damage to items in transit, etc. Due to these possible issues that may occur, we recommend ordering and receiving your materials prior to scheduling a project or prior to emptying your pool.